Herbst's bloodleaf (Iresine herbstii): growing, planting, caring. For glossy, bright red foliage, you can’t beat Herbst's bloodleaf! Herbst's bloodleaf is a fast-growing perennial - often grown indoors or as an annual. A native to Brazil where it thrives in warm temperatures and bright sunlight, the plant has two distinct forms: some with ovate leaves and others with obcordate (meaning : inversely heart-shaped) leaves. The type species is variegated green and yellow, but some cultivars have pink or crimson variegation. In its native environment, it reaches up to 5 feet tall but when grown as annuals or potted plants it will only grow 12 to 18 inches tall. Unless you live in a frost-free climate, you’ll have to grow this tender perennial as an annual or bring it indoors at the end of the season. It also makes a lovely houseplant. Among the many cultivars, ‘Brilliantissima’ with pink-veined bright red leaves, ‘Aureoreticulata’ with yellow-veined green leaves, ’Wallisii’ with dark-purple leaves or ‘Acuminata’, with pointy leaves are among the most popular. The seedlings sown in buckets are ready to be transplanted as soon as the plant reaches 10 to 15 cm in height, about 5 to 6 weeks after sowing, and of course after the last frosts. Plant Herbst's bloodleaf in full sun in a well-drained soil, rich in humus, remaining fresh or in partial shade, in finely worked culture beds (spotted, scratched then raked). Once the area is properly prepared, simply make a small hole in the dibble, remove the plant from its bucket, put it in the hole, and compact the soil to put it in contact with the roots. Install the seedlings at a distance of 60 centimeters from each other. Water copiously to facilitate rooting. Keep the potting mix moist in spring and summer by watering when the soil feels dry at a depth of about an inch. 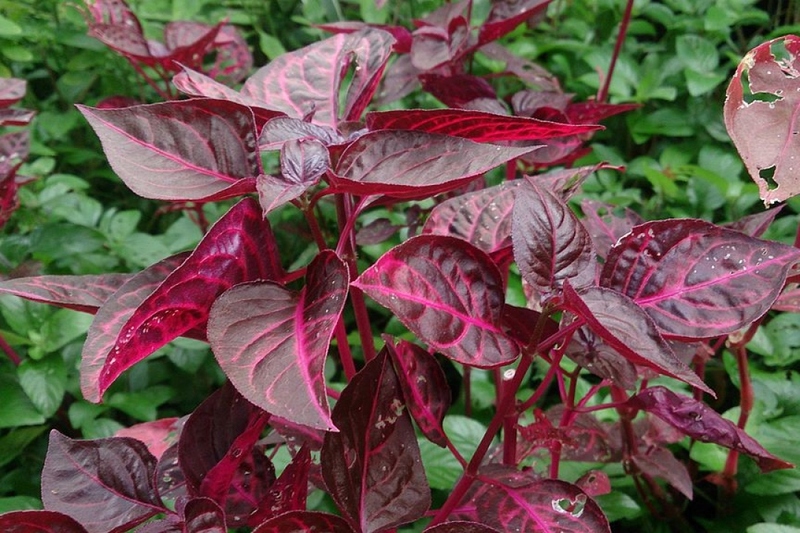 Bloodleaf plants need less water in fall and winter, but you should never allow the soil to dry out. In case of drought, the leaves become soft and flabby - in which case, water quickly ! The flowers are quite rare in culture, even outdoors, but bloodleaf plants easily grow from cuttings ! Follow the same procedure as for other cuttings. Cut twigs of about 20 centimeters, and plant them in a well-draining mixture. When the root system is developed, replant in a rich soil. If planted in a pot, bring it indoors before the first cold nights. When the nights are warm enough, you can put it outside - in partial sun or shade.